Humans are the ultimate invasive species, and the alien Swarmers need YOU in order to repel the human scourge from their home planet. Scottish independent developer Team Junkfish today announced the release date of eclectic turn-based alien adventure Attack of the Earthlings to be February 8th 2018. In Attack of the Earthlings, the humans behind Galactoil – a comically dysfunctional interstellar energy corporation – have travelled light years to Planet X13 and parked a gigantic space-drill to mine for fossil fuel reserves, sip the odd margarita in the sun and hunt big bugs. However, their latest foray into energy exploration has landed them in a bit of a pickle; they’ve unwittingly flattened a native species home and now the surviving “Swarmers” are out for blood. Combining turn-based combat and stealth in a dark comedic single player campaign influenced by the comic stylings of “The IT Crowd” and “Father Ted”, players take control of the “Swarmers”, a highly aggressive insectoid species, who must convert human flesh into alien muscle, evolve their units and even find the time to gatecrash a birthday party as they put a stop to the Earthlings’ interplanetary assault. To put a stop to the invasion, your Swarmers must plan attacks carefully, emerging from vents and lockers to take the human prey by surprise, and ambush multiple enemies at once to remain undetected. The more earthlings killed, the more corpses can be consumed and transformed into new units with specialized roles and unique abilities. The flesh of their own workers is the key ingredient to developing a successful alien insurgency against Galactoil. 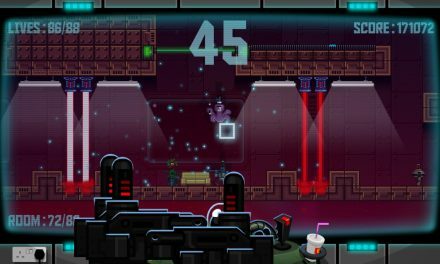 You must fight your way up Galactoil’s interplanetary drill, through absurd environments and passing quirky characters, with the goal of defeating the ultimate enemy: upper management! Team Junkfish described this game as “a breath of fresh air”, for the studio – a rather prolific gust that blew in talent such as voice actor SungWon Cho, who brings to life X13 mining operation Regional Manager Dennis Dickinham; a man both massively unqualified and massively overpaid. A gregarious fellow who finds joy in everything, be it catching a few rounds of golf with the boys or rerouting power from sickbay to the massage chairs in the boardroom, Dickinham’s a delight to be around! Just never, NEVER utter the phrase “bad idea” in his presence.